Daugavpils is the second largest city in Latvia. 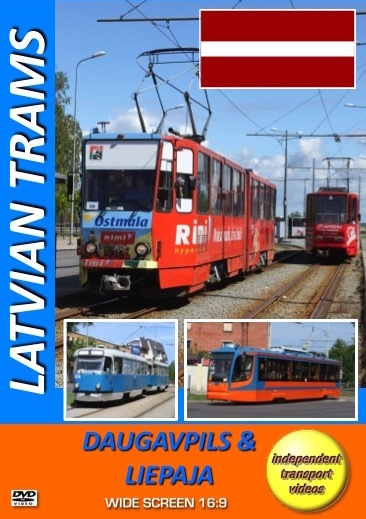 It is situated some 200 km south east of the capital Riga, of which the trams and trolleybuses were featured in our previous programme. Electric trams began running as late as 1946, shortly after the Baltic republic was incorporated into the Soviet Union. There are just three tram lines and the tram fleet at the time of filming, in May 2017, consisted of the older style Russian built Ust-Katav (UKVZ) KTM-5 cars, eight new low-floor 71-623 single-section cars as well as four new 71-631 three-section cars from this Russian manufacturer. There is also a small fleet of Tatra T3D trams that were acquired from Schwerin in Germany. Daugavpils trams still operate with trolley poles. Our filming covers the entire tram network, beginning at Vienības iela where we take a ride on UKVZ-built tram, 005 on Line 1 to Butļerova iela where we see the small tram depot and where one of the 71-631 trams is being manoeuvred. We then travel on tram 102 a UKVZ KTM-5 tram on Line 2 to Saules veikals. The main road, 18. novembra iela, is our next location, and here we see a preserved RVZ-6 tram, on display in an enclosed area. We now board tram 108 on Line 3 to Stropu ezers, which is one of the terminus of Line 3. From here tram 101 takes us to Ventspils iela for more filming. We then travel on tram 102 to the other terminus of Line 2 at Maizes kombināts. Staying with tram 102 we return to 18. novembra iela in order to take a ride on board Tatra T3D cars 080+079 on Line 3 back to Stropu ezers and then return back to Vienības iela for the Tatra experience! We take a brief look in at the bus station and see a brand new Solaris Urbino 12 100% electric bus passing through. We also film at Stacija, which is the other terminus of Line 1. Our final tram ride in Daugavpils is on Tatra T3D cars 074+075 to the other terminus of Line 3 at Cietoksnis. Here the trams turn around on a large turning circle, which is situated next to the historic Daugavpils Fortress. We conclude our visit with some still photographs taken by Steve Kelly on a journey he made to the city in 2007. The second visit on this DVD programme is to the Latvian city of Liepaja, which is situated by the coast of the Baltic Sea. The electric tramway was opened in 1899 when Liepaja was part of the Russian Empire. Today there is just one line that runs north-south past the railway station. The tram fleet at the time of filming in May 2017 consisted of just 17 Tatra KT4 trams, 12 having been acquired from the German cities of Cottbus, Gera and Erfurt. Liepaja replaced the trolley pole with the pantograph as early as 1961. Our filming covers the entire system, starting at Rīgas iela by the railway station, and continues as we head towards the city centre. We take rides on trams: KT4SU 229 and former Cottbus KT4D 236 as well as former Erfurt KT4D 246, covering the entire route, stopping off as we travel for shots of the trams running in this interesting Latvian city. We hope you enjoy this journey through the Baltic States as much as we did filming it!